First published on Red Alerts in May of 2010. Notice I said survivalist. The professional trapper will want to read more conventional literature, although The Trapper’s Bible belongs in every library. The Trapper’s Bible is not about fur trapping, but an instruction manual for putting meat on the table and guarding one’s person and property in situations where game tags, season limits and poaching fines are not a concern. In other words this is a book that will describe to you how to trap for game in a SHTF scenerio. The majority of the traps found in the book are snare sets which are simple to set up (with practice) and very cost effective. A little scrounging through a junk drawer and a knife to cut sticks with are all you’ll really need. Dale Martin has a chapter on “pest” snares and a separate one on taking larger animals. Both his illustrations and descriptions will allow even the most novice outdoors person to become proficient in making and setting these sets. Before you start remember that snaring is not legal in many places so don’t harvest any game while practicing this skill unless you have checked your local laws first. There’s also a chapter on traps used to catch animals alive, theoretically to transport nuisance animals from one place to another but these traps will come in handy post-TEOTWAWKI when you don’t want a dead animal rotting and predated on your trap line. 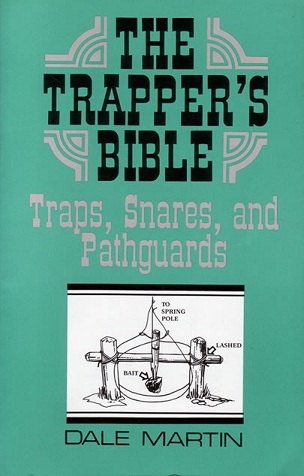 The Trapper’s Bible ends with “last resort’ traps which are camp alarms and booby traps to use when you’re in hostile territory. Again his instructions and illustrations make it easy for even the novice to build these traps. If food becomes scarce many survivalists claim they will be hunting for meat. This is a sure way to starve to death. Running a trapline made of simple, cheap and available materials that can be easily hidden from prying, hungry eyes will be the best way to “make meat” post-TEOTWAWKI and Dale Martin’s Trapper’s Bible is the best guide to building a survival line. These traps will also come in handy for gardener’s trying to keep pests out the ever more important home garden. This book belongs in your survival library.